Jens Ingebret Evensen was a Norwegian lawyer, judge, politician, trade minister, international offshore rights expert, member of the International Law Commission and judge at the International Court of Justice in The Hague, member of The Swedish Order of the Polar Star and Commander Of The Royal Norwegian Order of St. Olav. 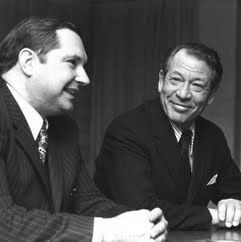 He negotiated Norway's trading deal with EF in 1972 as minister of commerce, serving in this role in the governments of both Trygve Bratteli and Odvar Nordli. He then served as ocean minister until 1979. He worked to secure government income from Norwegian oil discoveries. The "Gray Zone" deal was also his work. UN's oceans treaty is greatly fundamental based on Evensen's work. Former Labour Party politician and head of Norwegian Broadcasting Corporation Einar Forde called Jens Evensen "one of the great Norwegians of the last century."